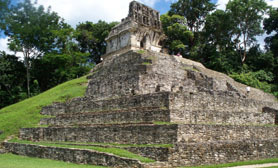 The Chiapas name is derived from “Chiapan” or “Tepechiapan” the name of an indigenous population. The term is from Nahuatl and has been translated to mean “sage seed hill” and “water below the hill.” After the Spanish arrived, they established two cities called Chiapas de los Indios and Chiapas de los Españoles, with the name of Provincia de Chiapas for the area around the cities. The modern coat of arms shown above on this website was created by Chiapas painter Javier Vargas Ballinas.